My hubby is a big zelda fan, so I made this blankie for us to use when we have a baby! 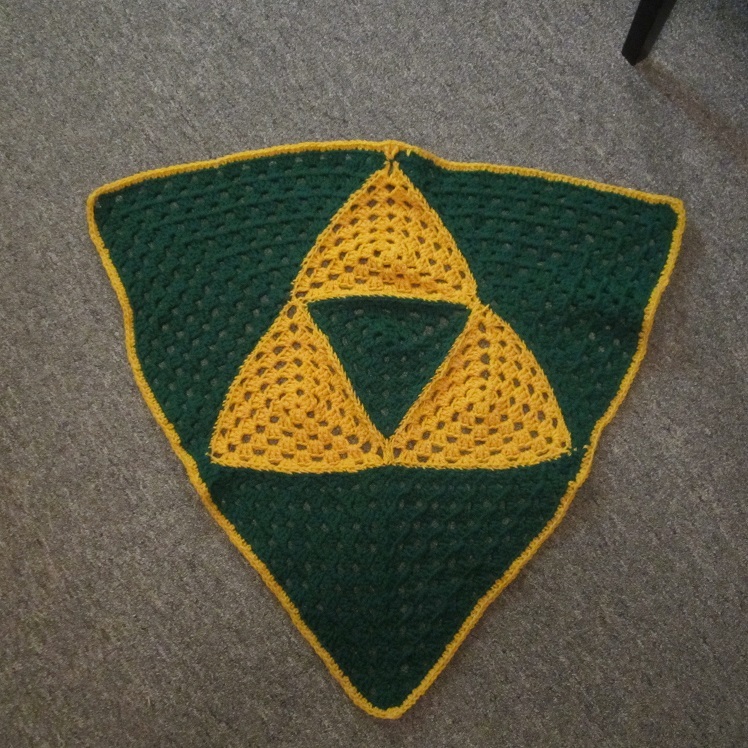 (Some day…) But who doesn’t need a Triforce baby blanket for their hope chest??? I made this pretty small, so it should be crib blanket size, or even stroller blanket size. I would assume you could make it bigger if you just keep making the triangles bigger. I wanted to make it square, at first, but then when I made the first half granny square to go on it I realized that if I sewed it in place it would wind up making it slightly off from a squared shape, but when I stepped back and looked at it, it became obvious that I had stumbled upon a shield shape! Had I been trying for that, it probably would have taken weeks to figure out! 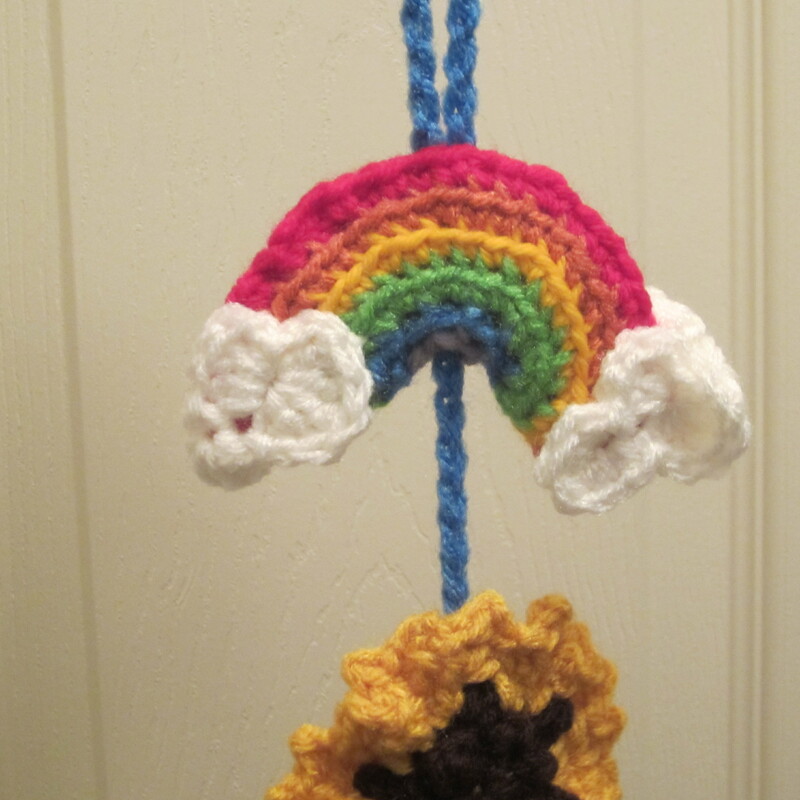 This is made using a triangle bunting pattern that I found here, and a half granny square pattern that I got here. They’re both free patterns, and I’ll tell you what I did for the border in just a second. 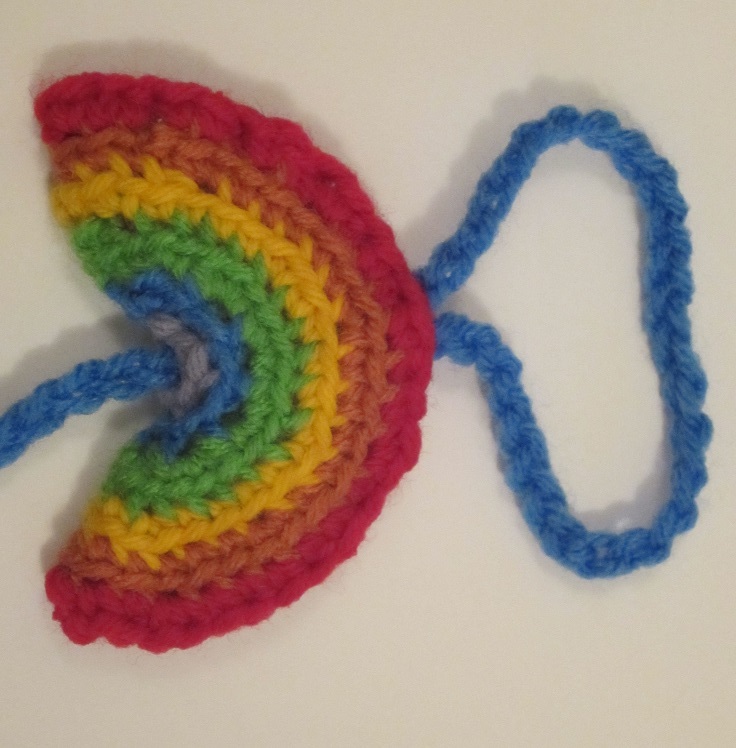 First I’d like to remind you that the triangle bunting pattern is in UK terms, so you will be using US double crochets and NOT tr cr. I used the bunting pattern for the three gold triangles and the one center green triangle. I made the center triangle one round less than the three gold triangles. I did six rounds for each gold triangle, and five rounds for the center green triangle. I used Red Heart Super Saver Yarn and size K hook. 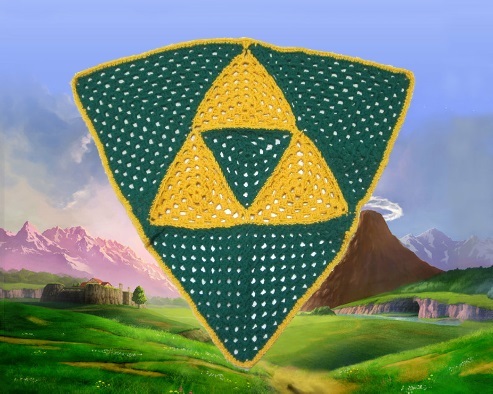 The three large triangles around the Triforce are half granny squares. Twelve rows on each of those matched up for the squares I made. Like I said before, you maybe able to adjust the size of the blanket by simply making larger gold triangles and then making the half granny squares larger until they fit proportionately. 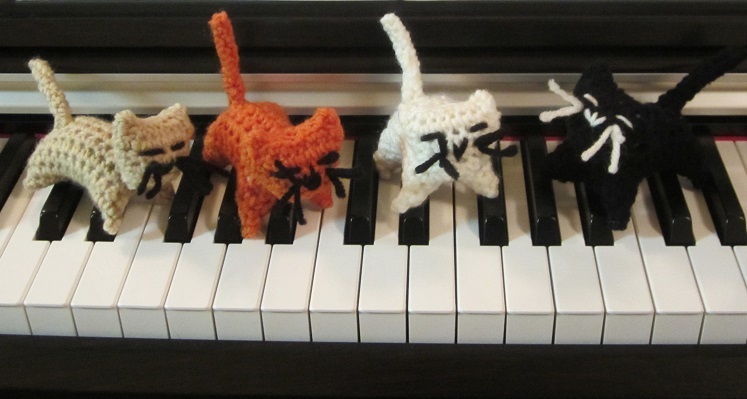 I used a yarn needle to sew it all together. 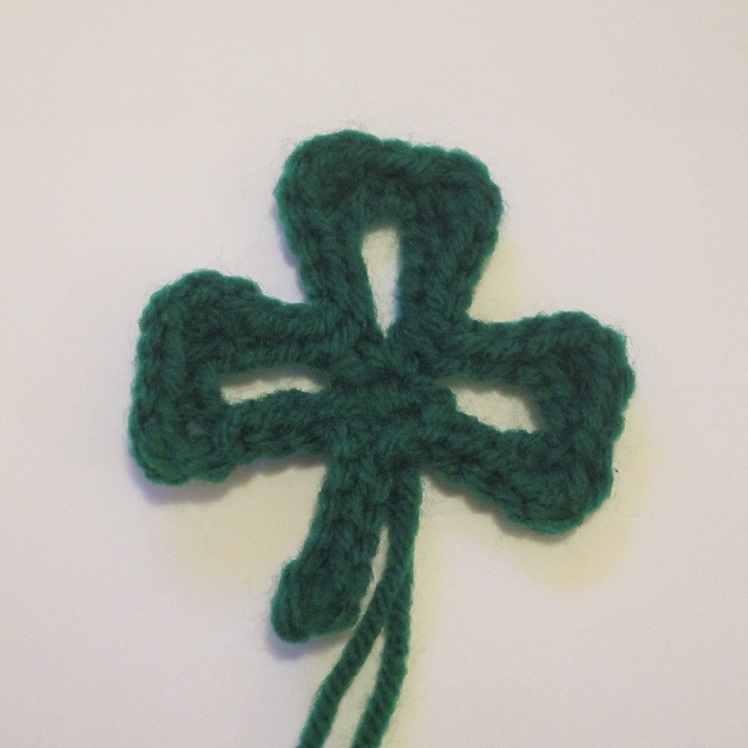 For the border, I worked in the back loops, and I did half double crochet stitches all the way around, one in each of the three stitches and then on in the chain between the fan stitches. In each of the three corners, I worked (hdc, dc, hdc). Hey!!! You guyz have got to go check out this post on yarn organization and keeping up with what colors/brands of yarn you have! It will revolutionize the way you are trying to keep track! It’s genius! Admin Important was surfing around and happened upon the post and shared it with me right away, and now I must drop everything and share it with you! I’ll add a picture here to entice you, and you can click on the picture or the link above to take you there to check it out! So neat and clever! 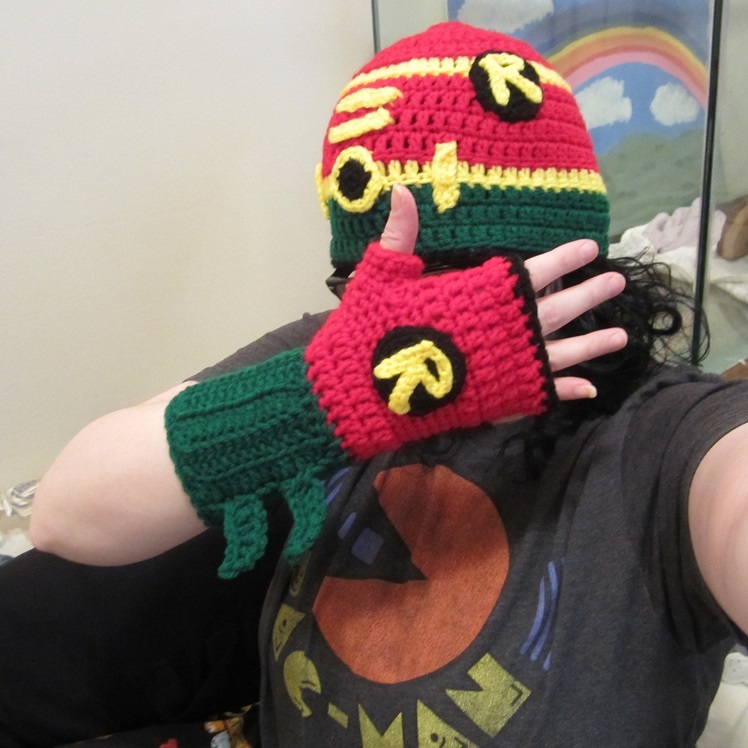 I designed this set to make a matching Robin set, but you could also change the color combination and make all kinds of superhero sets from this! Ex: Gray + black + yellow = Batman.Green + Orange/Gold = Aquaman. Red + Blue + Yellow = Superman/Supergirl. Yellow + Gray + Blue = Retro Thor. You could search Amazon.com for iron-on hero patches (and then sew them on), or get crafty and design your own symbol! 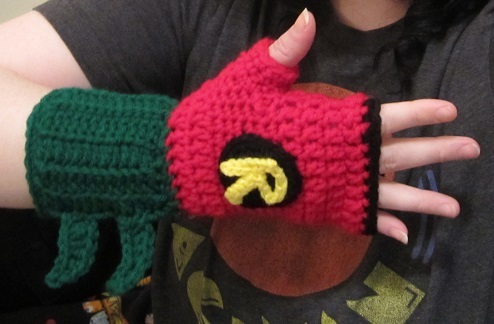 *Use a K hook, an F hook, and Red Heart Super Saver Yarn. *On any rounds after I switch colors, I like to work in the back loops only of the round with the new color, but this isn’t necessary unless you also like the little ‘line’ that appears as a result as well. *Use a K hook for hat. Rnd 7-10: Ch 2, dc in next st and around. Jn. Rnd 11: Repeat Rnd 7 with yellow. Rnd 12-14 : Repeat Rnd 7 with green. 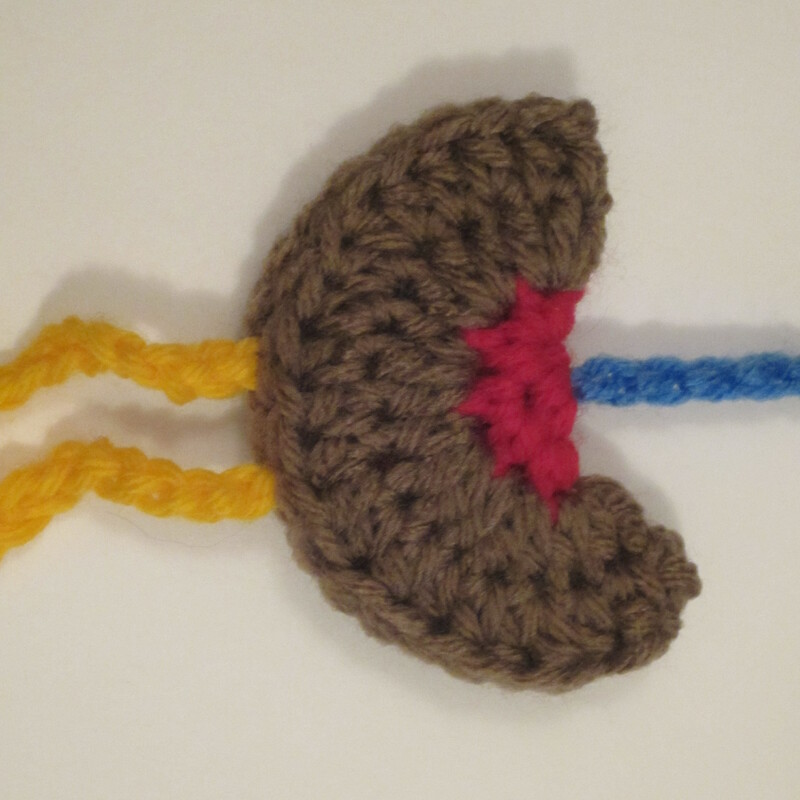 Rnd 15: Optional single crochet round. With black, jn with sl st, ch 1, sc in same st and around. Jn. Fasten off and weave in all ends. 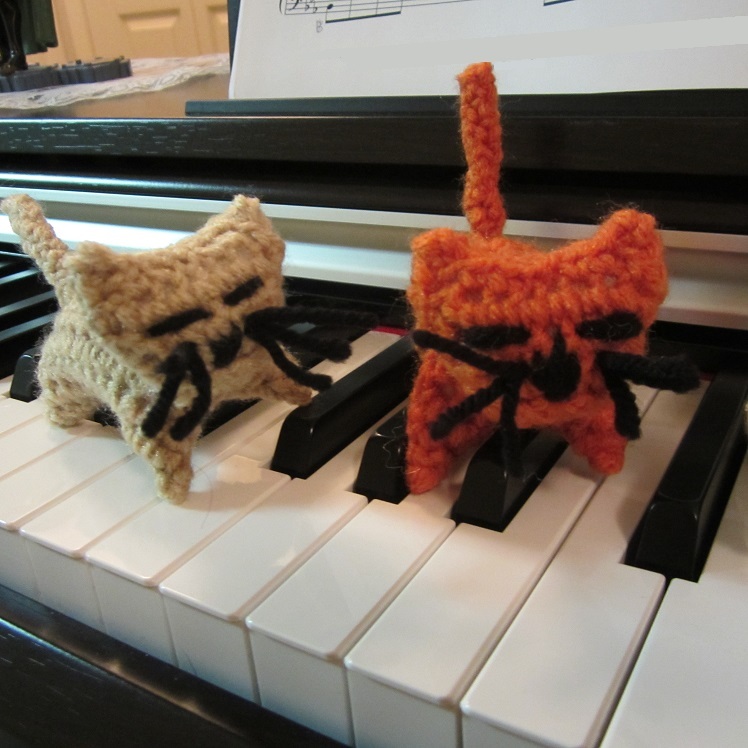 (I use a yarn needle to help me weave in the ends. *Use an F hook for hat accents. Make two for the strips in the red: Ch 9, sc in 2nd ch from hook and across. Ch 1, sl st in same ch as last sc. Fasten off leaving tail long enough to sew strip to hat. Make two for belt buckles: Ch 7, sc in 2nd ch from hook and across. Ch 1, sl st in same ch as last sc. Faste off leaving tail long enough to sew strip to hat. Rnd 1: With black: Ch 2. Work 6 sc into the 2nd ch from hook. Jn with a sl st in first sc. Rnd 2: Ch 1. Work 2 sc in each st around for a total of 12 sc. Jn with a sl st in first sc. Rnd 3: Switch to yellow. Working in back loops only this round, jn with a sl st in an sc. Ch 1, (sc, 2sc) around. Jn with a sl st in first sc. For the ‘R’ patch, use an F hook and make another belt buckle except use black for all three rounds. Add a fourth round by: Ch 1. 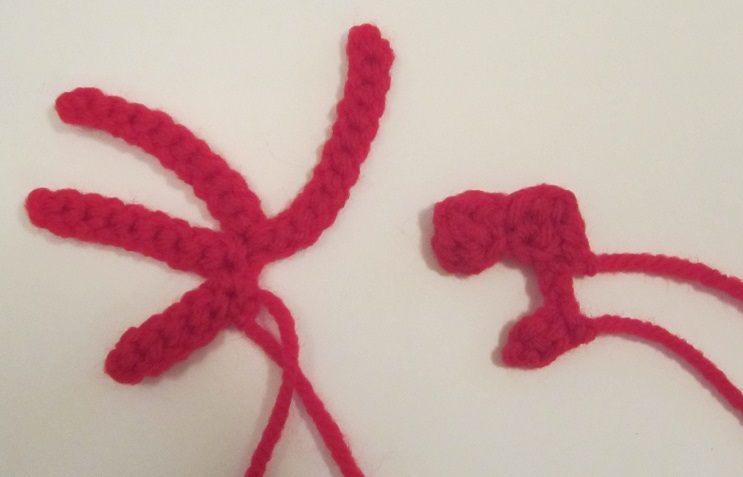 (sc, sc, 2sc) around and joining with a sl st.
Then use a yarn needle and yellow yarn to stitch on an ‘R’. If you’d like some instructions to make an ‘R’: Use an F Hook, Ch 7, sl st in 2nd ch from hook and up chain, ch 8, attach end of chain to center of first slip stiched chain, ch 6, sl st in 2nd ch from hook and up the chain back to the center of the ‘R’ once again. Fasten off leaving a tail long enough to stitch ‘R’ to the patch. Use size K (6.50 MM) hook. I use Red Heart Super Saver Yarn. *IMPORTANT NOTE* There is a slightly different pattern for the right and left hands. Make sure you’re working on the correct hand consistently. *Join with a sl st in the top of the 1st sc or dc at the end of each round unless otherwise stated. Rnd 2: Flip ring so that you’re working in the original chain once again. Ch 2, dc in same ch and around. Jn. Rnd 3-4: Ch 2, dc in same st and around. Jn. (20 dc in each round not counting the first ch-2.) Do not fasten off. * Each round will end right before the thumb. Left Hand Rnd 8: Ch 2, dc in next 4 st, dec once, (should be right after thumb), dc to end of rnd. (21 st; or 19 dc and 1 dc dec) Fasten off. Right Hand Rnd 8: Ch 2, dc dec, dc in next st and around. (21 st, or 20 dc including first ch-2 and one dc dec) Fasten off. *Will work back and forth in rows. To line the bottom of the glove, ch 1 and sc around the bottom edge of the glove, joining with a sl st as if it is a round rather than a row. Fasten off leaving a tail long enough to sew the side of the glove together. *Note* You may want to add an extra sc here and there along the side so that the end of the glove is wider than the wrist edge on the opposite side where you will sew it to the top part of the glove. Your arm gets wider further up your arm….so adding a few extra stitches here and there along the border will help that shape. Sew the top and bottom of the glove together. * Go back to the finger tips of the glove. With black, jn with a sl st, ch 1, sc in same st as join, sc around. Jn with a sl st in first sc. Fasten off and weave in ends. * Go back to thumb. With red, jn with a sl st anywhere in thumb, sc in same st as join, sc around. Jn with a sl st in first sc. For the next round, ch 1, sc around and jn with a sl st. Repeat until thumb is as tall as desired. 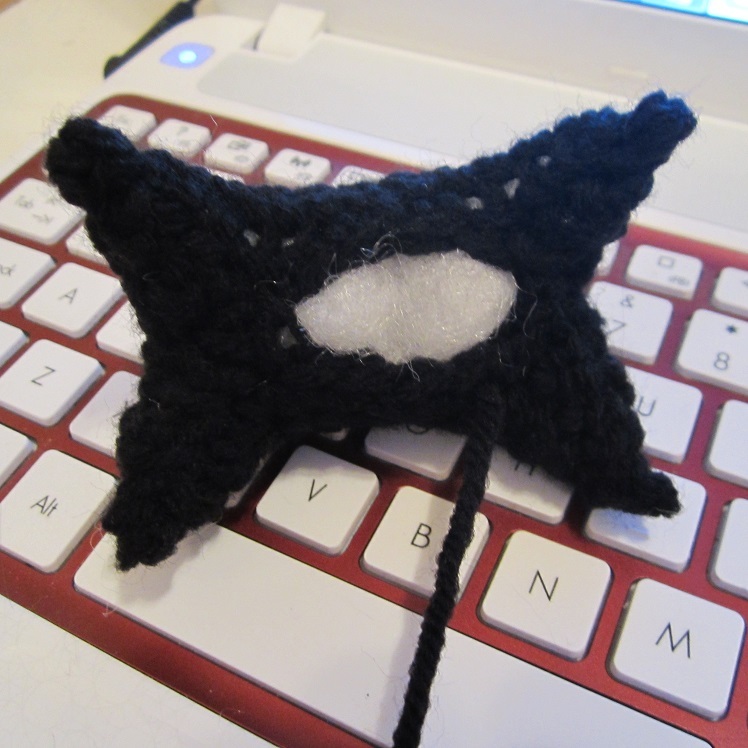 Make two or three and then sew onto the lower part of the arm. Ch 6, sc in 2nd ch from hook, (sc, hdc) in next ch, dc in last 3 chs. Ch 2, sl st in same ch as last dc. Pivot. Sl st back across chain to end. Ch 2, sl st in 2nd ch from hook and join with a sl st in the very beginning sc. Hey ghoulz! I have finally done it! 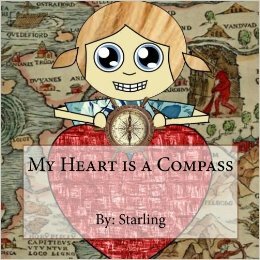 I published one of my children’s books! Yaaaay! I’m thinking it’s for around preschool/kindergarten age, but I think even adults should be able to enjoy the artwork and the message of compassion and empathy. It’s the kind of book you can read to a child up until they’re able to read it themselves and understand the message more and more fully as time goes by. I was looking to make a story that is both simplistic and complex at the same time so that hearts of all ages will thump with endearment at the pages. I think the more times I read through it, the deeper the meaning becomes to me as well, so I hope all my ghoulz and baby ghoulz out there will enjoy every page! I use Red Heart Super Saver Yarn and a size H hook. Rw 3-12: Repeat Rw 2. You should now have a rectangle. The shorter ends are the front and back. Fold each corner in on itself and sew up it to make each leg. There should be a little bit, maybe a stitch or two, left over in the very center. You’ll stuff the body from there and then finish sewing it up. Rw 1: First ear row: Ch 9. Sc in the 2nd ch from hook, ch 3, sl st in 3rd ch from hook, sc in next 2 ch, sl st in next 2 chs, sc in next 2 ch, ch 3, sl st in 3rd ch from hook, sc in last chain. Pivot work so that you are working beneath the top ear row you just created. *You’ll now work down in rows making the head smaller until you get to where the chin will be, and then it will get larger again until you repeat this first ear row to mirror what you just made. It will be folded in half and sewn up. I will detail out each row for you, though, of course! Rw 12: (Ear row) Sc in the first st, Ch 3, sl st in the 3rd ch from hook, sc in next 2 sts, sl st in next 2 sts, sc in next 2 sts, ch 3, sl st in the 3rd ch from hook, sc in the last st.
For the whiskers, to keep them from coming off, I take one longer piece of yarn to make two whiskers, but rather than thread them from one side of the nose to the other, before I attach the head I knot the center of the long piece of yarn in the same place I’m going to sew the head to the body so that it will disguise the different color. 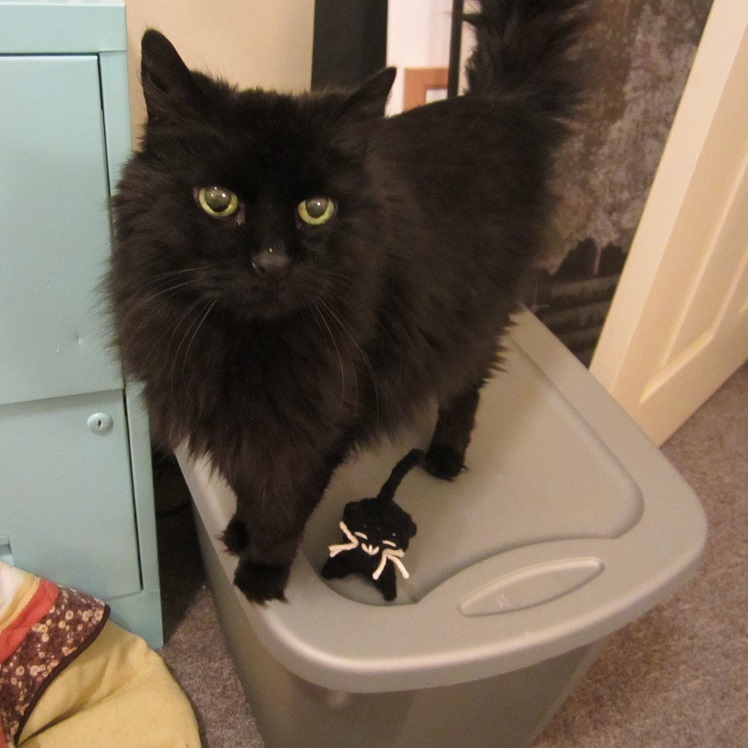 Then I thread both ends all the way through the head and out on each side of the nose to make two whiskers. I do that three times. 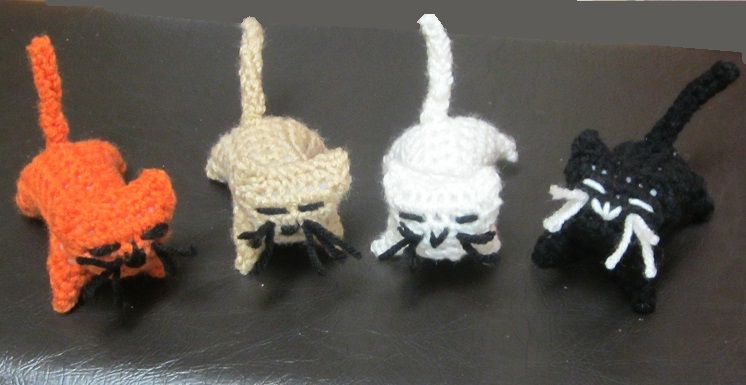 If you’re not worried about the whiskers coming out because you won’t be playing with the pocket kitty, then feel free to just thread a tiny piece of yarn from one side of the nose to the other. Ch 9, sc in 2nd ch from hook and across, ch 1 sl st in same ch, pivot work, ch 1, sc in same chain and back up the chain. 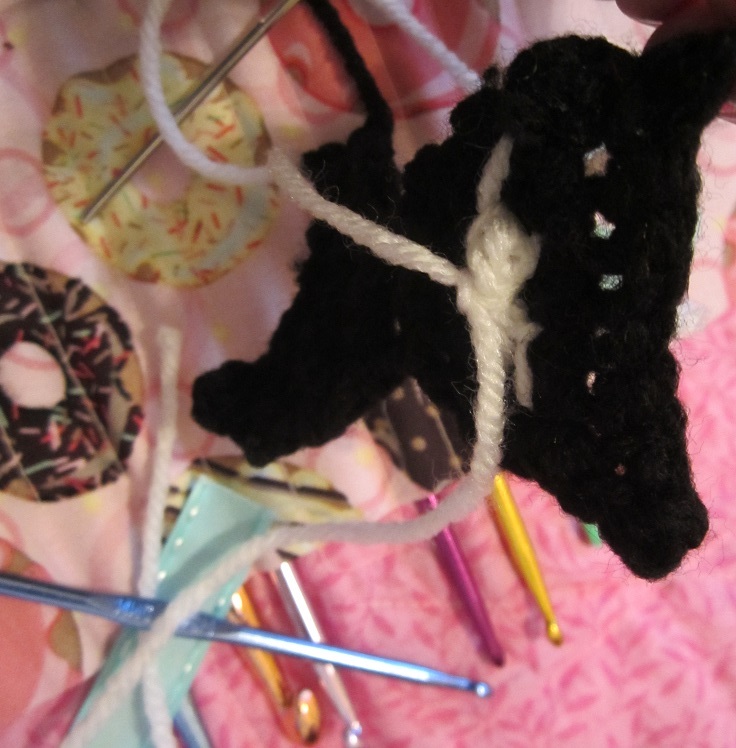 Fasten off leaving yarn long enough to fold the tail in half long-ways and seam it up and then sew the tail to the body. 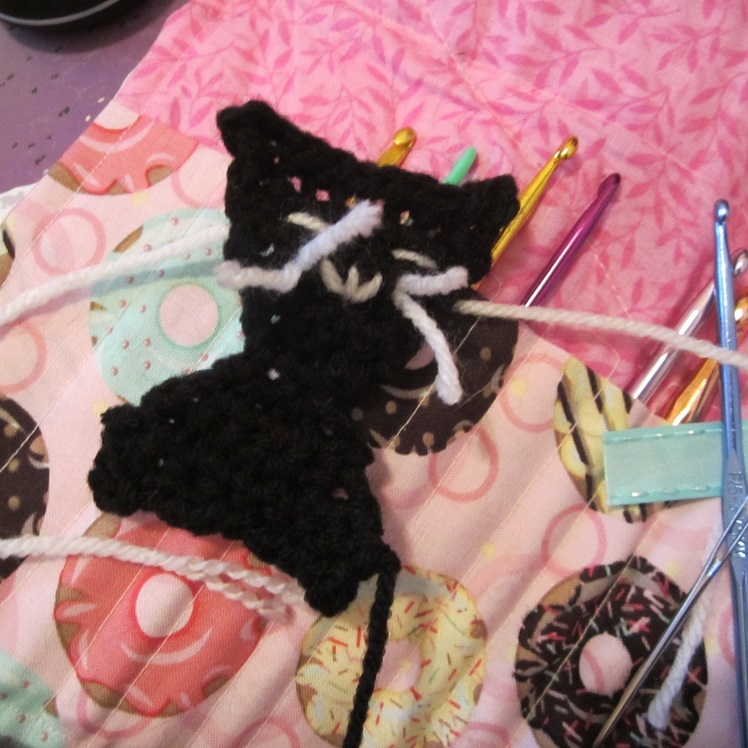 The two rows folded together will make sure the tail will be stiff enough to poke straight up like a curious kitty. 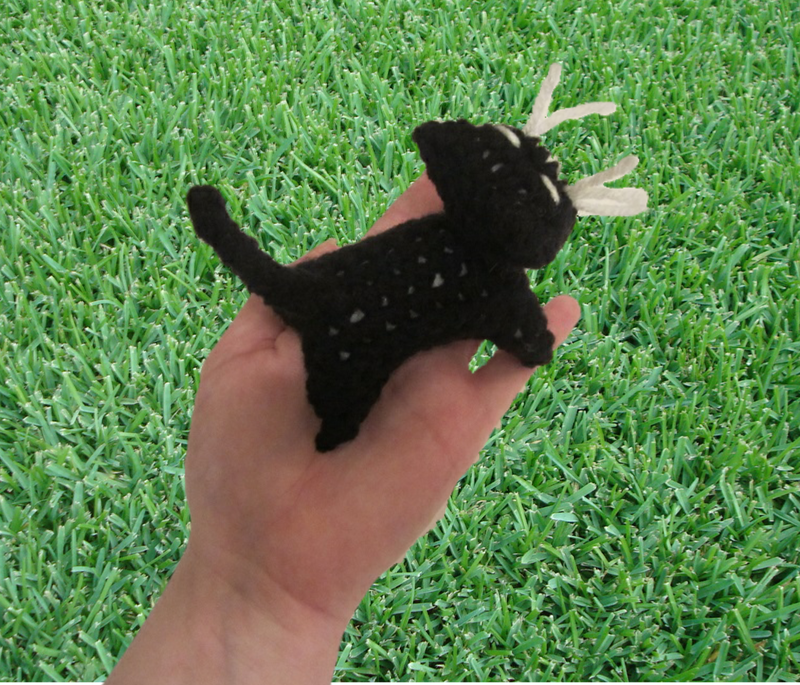 Sew the parts together and use a yarn needle to stitch on some eyes, a nose, and whiskers! 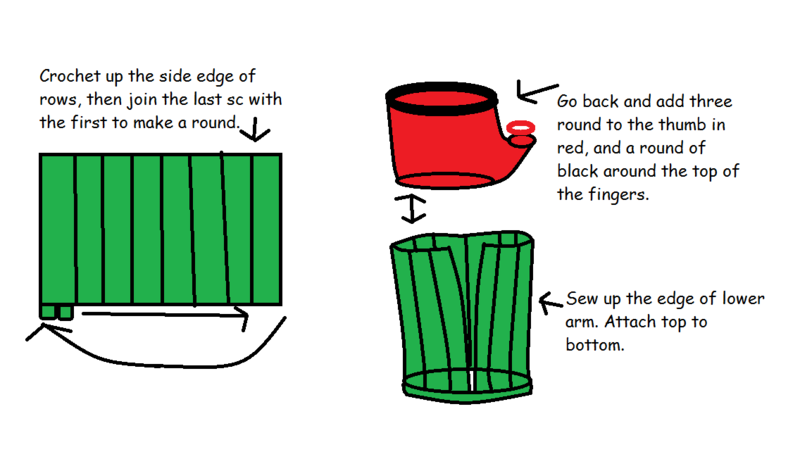 This is a picture I found online but I’m not sure of the origin of this little tutorial. Okay, ghoulz. If you click on the picture above it will link to where I found this tutorial picture, but I can’t tell from that site if this is their original picture or not. If you know where the origin of this pic is, let me know! 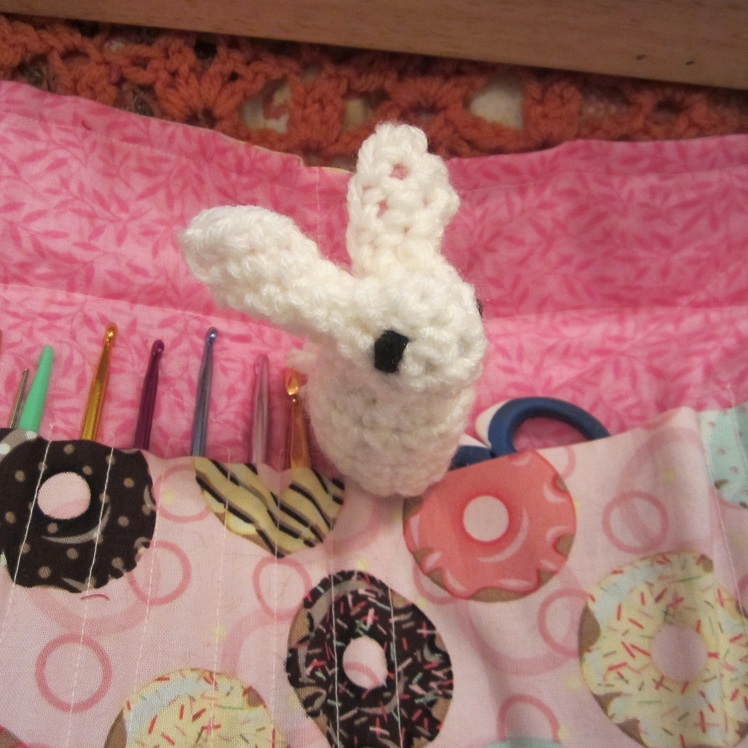 Now that we have that out of the way, check out that kewl idea up there for a lil’ bunny! I’m imagining him as pocket size, so I’m going to do my best to follow the picture and make one of my own. In the picture up there they use blue yarn so you can tell where they weaved the yarn through. I used white so it wouldn’t be visible. You thread your yarn through the center from left to right, then weave it in and out up to the center top of the square/rectangle, then weave it back down to where you started. 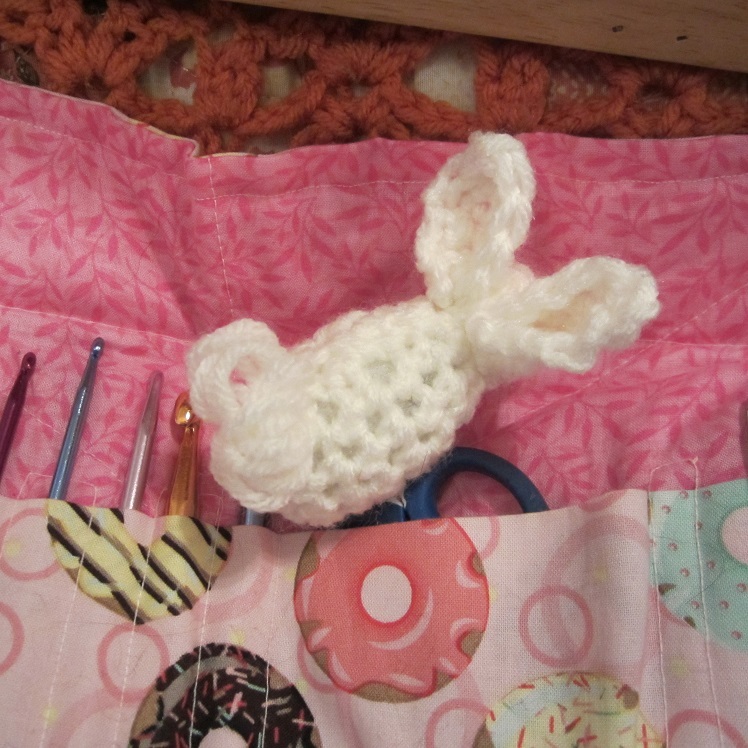 After this you can pull that yarn tight so that the head closes around your stuffing/cotton ball and the ears turn in for that cute shape. Then sew it down the back, stuff the body and sew the bottom closed. 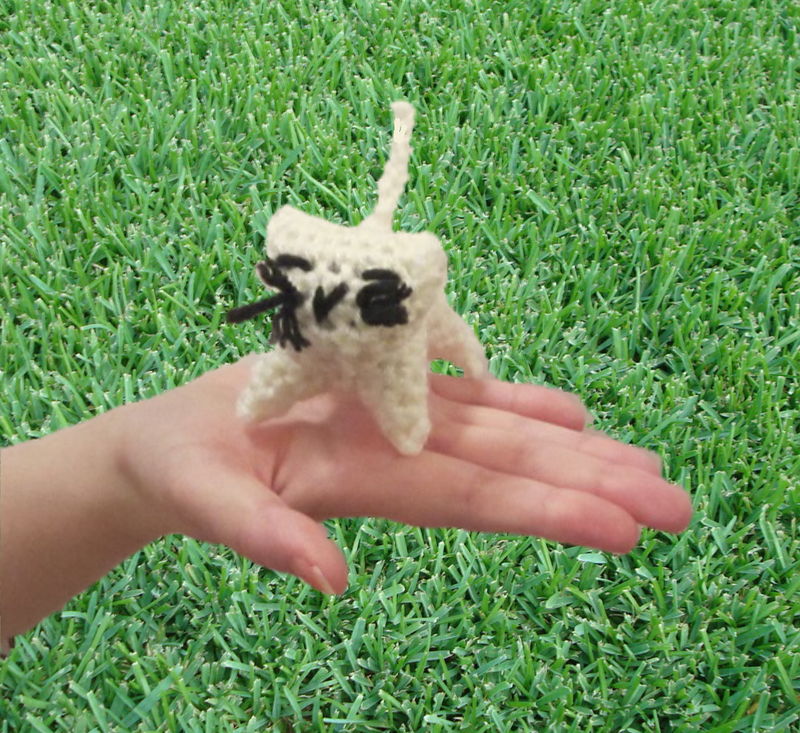 I made the puff tail by wrapping the yarn around my index finger about 20 times and then using a yarn needle to feed the yarn through the center and tie it in place…then sew it to the body. On another note, doing this I made it a little too tight and it got stuck on my finger. I cursed at it and dug until it finally came off because I was too lazy to unwind it and start over more loosely. Bunny tail at your own discretion. I use an F hook, a K hook, a yarn needle to weave in the ends and sew the pieces in place, and Red Heart Super Saver Yarn. 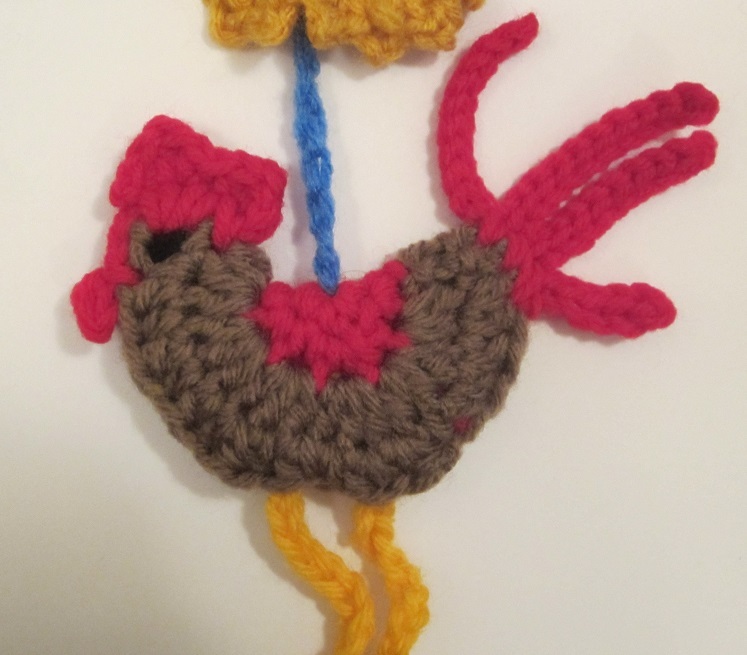 I’ve added the sunflower pattern below for the summertime rooster charm shown above as well. 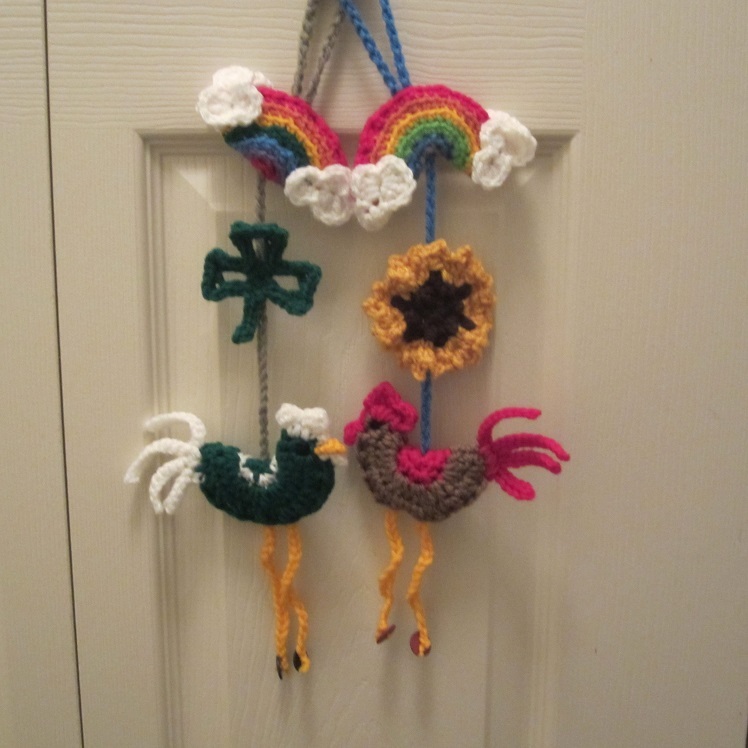 Both roosters are done with the same pattern and different colors. Rnd 1: Ch 2, (sc, ch 10) three times into 2nd ch from hook. Sc again into the hook. Jn with a sl st in first sc. Rnd 10: Along each leaf of 10 chains: Sl st 3 times, (sc, hdc, sc) into the next ch, sl st in next 2 chs, (sc, hdc, sc) into next ch, sl st in last 3 chs. Sl st into the next sc. Ch 6, sc in 2nd ch from hook. Sl st back up chain and jn with a sl st in the next sc. Fasten off. Ch 6, sl st in 2nd ch from hook an in last 4 chs. Ch 9, sl st in 2nd ch from hook and in last 7 chs. (Ch 11, sl st in 2nd ch from hook and in last 9 chs) twice. Sl st 3 times across the bottom back to the beginning chain. Fasten off. Ch 3, sc in 2nd ch from hook, sl st in first ch. Ch 7, (hdc, dc, hdc) in 2nd ch from hook, sl st in next ch, (hdc, dc, hdc) in next ch, sl st in next ch. Fasten off. The two unworkd chains will be where the beak will be placed. With an F hook, ch 3, sl st in 2nd ch from hook, sc in next chain. Fasten off and sew onto head. With a K hook and leg color, ch 40. Fasten off. 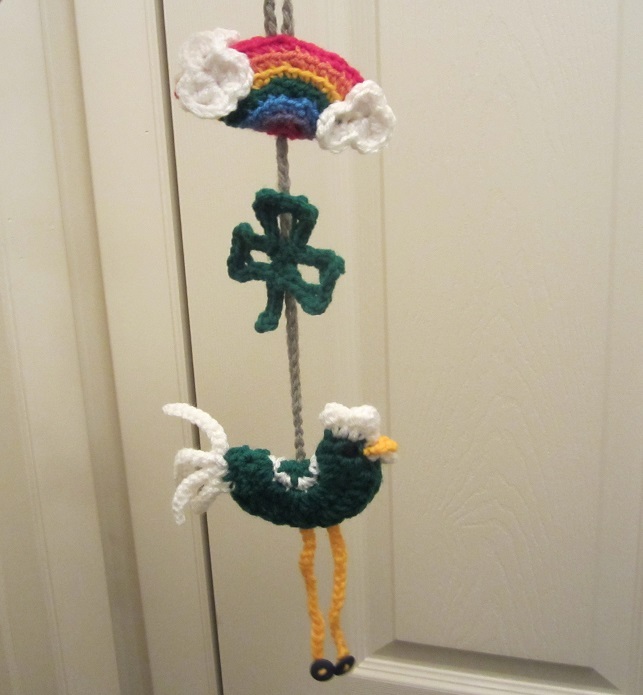 Leave enough yarn on each end of the chain to thread it through a button or bobble for decoration. With a K hook again: Chain 60, jn with a sl st in the 30th ch from hook to make the handle. Join the bottom of the chain to the center of the leg-color chain strip by first threading it through the center of the rooster body. Knot it so that it will stay. *Work in the back loops only of the rounds of the rainbow. *Jn with a sl st in first sc at the end of each round. Rnd 5: Ch 1, (sc in next 5 sts, 2sc) around. Jn with a sl st in first sc. Make 4 with an F hook. Ch 4, (hdc, 3dc, hdc) into 2nd ch from hook, sl st in next chain. (Dc, 3tr, dc, ch 2, sl st, hdc, 2dc, hdc) into last chain, pivoting work so that you can sl st into the middle chain. Then join the round with a sl st in very first sc. 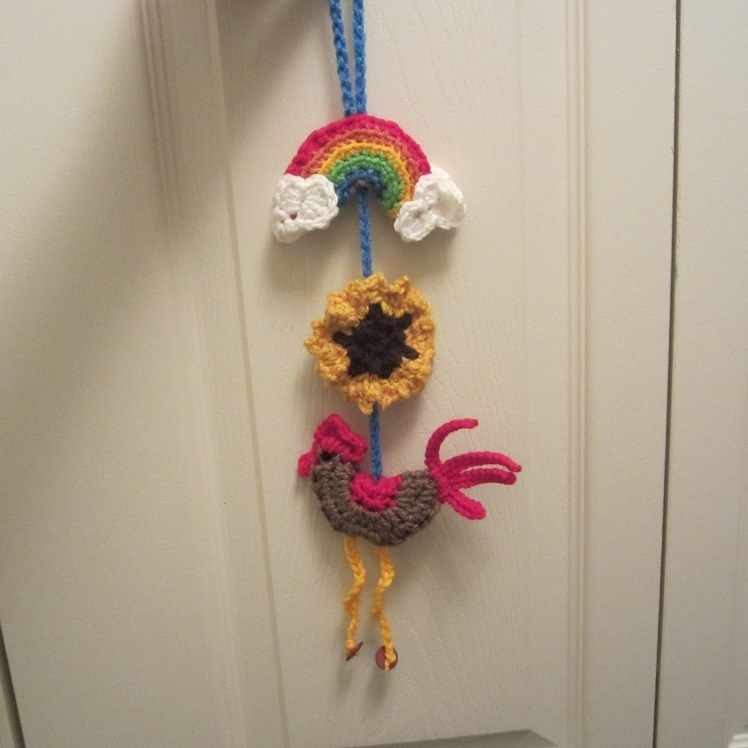 The sunflower is if you are making the sunflower rooster version for a summertime charm rather than a lucky charm. Rnd 1: Ch 2, in 2nd ch from hook, (sc, ch 2, sc in 2nd ch from hook) 6 times. Jn with a sl st in first sc. 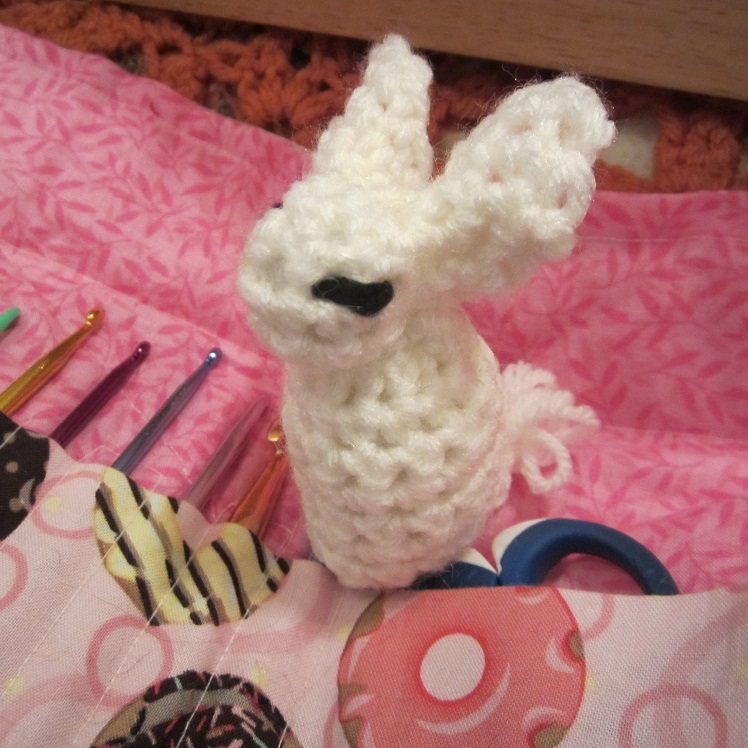 Rnd 2: In this rnd and next 2 rnds, you will only be working in the single crochet stitches that were done in the round. Not the ch-2-sc-in-2nd-ch-from-hook stitches. (Sc, ch 2, sc in 2nd ch from hook, sc) in each st around. Jn with a sl st in first sc. Rnd 3: Switch to yellow and jn with a sl st in same st as join from Rnd 2. Ch 1. (Sc, ch 2, sc in 2nd ch from hook) in same st as join. (Sc, ch 2, sc in 2nd ch from hook, sc) in next st. *(Sc, ch 2, sc in 2nd ch from hook) in next st, (sc, ch 2, sc in 2nd ch from hook, sc) in next st. Repeat from * back around to first sc. Jn with a sl st in first sc. Rnd 4: Ch 1, begining in same st as join, *(Sc, ch 2, sc in 2nd ch from hook) twice. (Sc, ch 2, sc in 2nd ch from hook, sc) in next st. Repeat from * around. Jn with a sl st in first sc and fasten off. 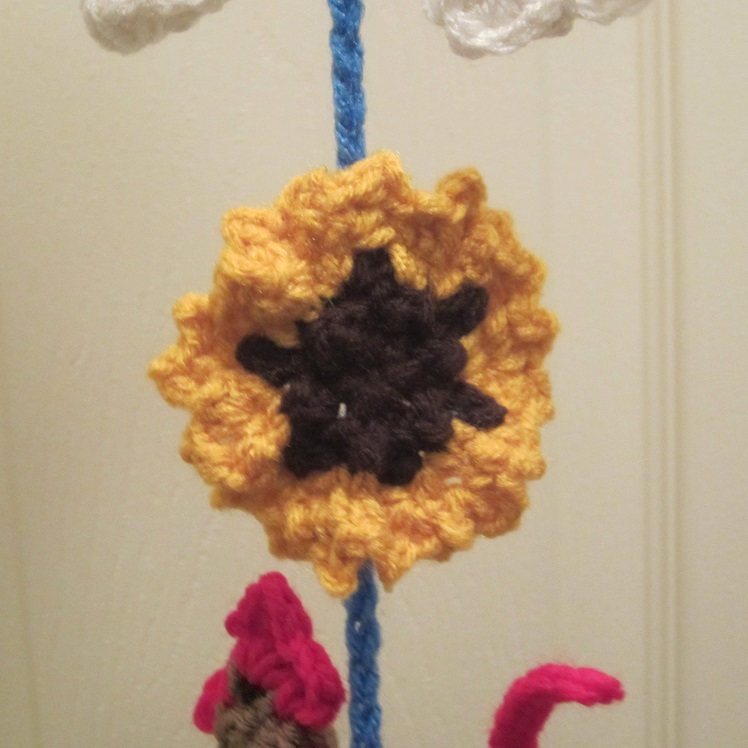 Sew Sunflower to chain.